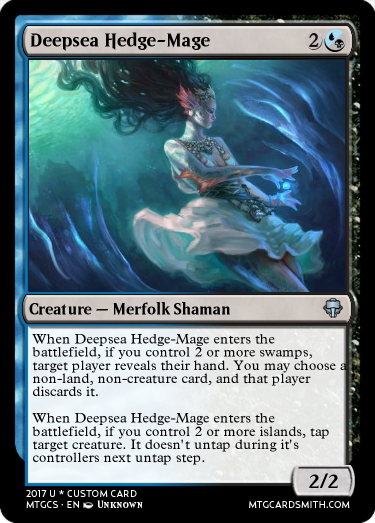 Eventide contained an interesting set of creatures call hedge-mages . These where 2/2 creatures for three mana (2 generic and 1 of hybrid enemy colors). They have two ETB effects that only trigger if you control two lands of the right basic land type. The point of this contest is for you to create your own hedge-mage creatures. Whether that means creating a new one for allied colors or remaking an enemy colored one you think could have been better. 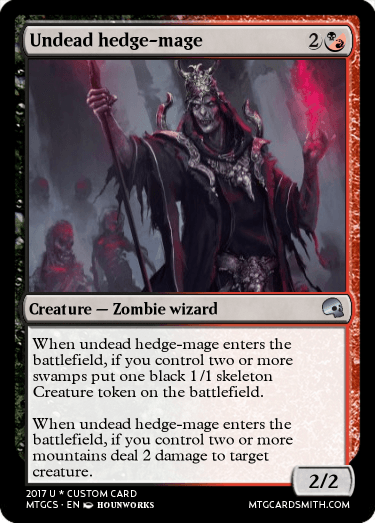 - Flavor, while the original hedge-mages aren't super flavorful cards themselves, your cards should be something that makes sense with the name "hedge-mage"
Since I started playing during Tarkir, what better way to do this than with a cycle of Hedge-Mages from Dragons? I did not include the "you may" for each ability, as was in the other hedge mages. This is because I very feel much, flavorfully, that these hedge-mages are following the orders of their Dragonlords, so I didn't give them an option to not oblige. If that is problematic, I would be happy to go back and redo the cards to add it. I thought I'd make one that also fits a set i was making. Any thoughts? One side of that is much more useful than the other. We've got a good line-up of Hedge-Mage's already entered in the contest. All these entries fit the theme so well, i know it's gonna be hard to judge them. With that said, this contest is still open for six more days. I hope to get even more entries which i can judge and enjoy. A more simple design while still on Shadowmoor. Now closed for judging. I should have results up sometime tomorrow. First off will be all the honorable mentions. 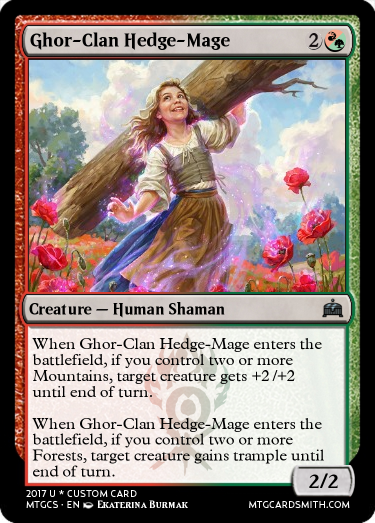 @Faiths_Guide It makes sense that each of the Ravinca guilds would have a hedge-mage so flavor points there. The abilities all seem balanced at fit fit the colors well. 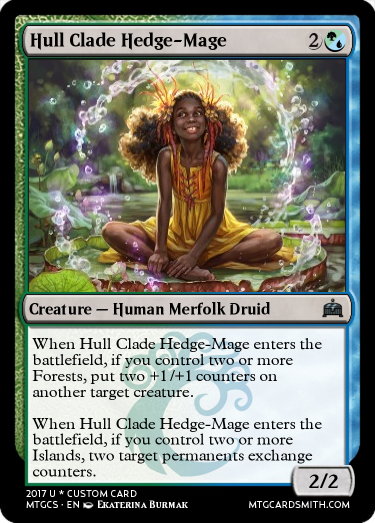 The art of the Hull Clade and Ghor-Clan mages seems kind of too happy though. 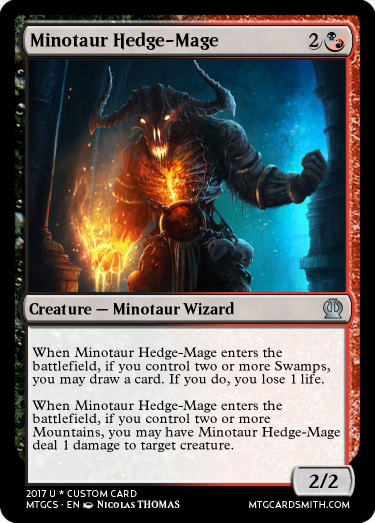 @Beck I enjoy seeing cards from some of the more obscure MTG tribes like Minotaurs. Both abilities fit their color well and could be impactful in a game. The art fit nicely so well done overall. @ReddEnderman As you said a pretty simple design but one i think would be effective. It does exactly what you would want an aggressive goblin to do make bodies and deal damage. @Zizick123 Nice, i like how both of the abilities fit in their colors and support a control theme really well. @Sanjay666 The effect this one gives you pretty powerful though the interaction between the two abilities is a bit awkward. And now onto the top three. I like that you chose to make the token a skeleton instead of a zombie, giving some love to a lesser-used creature type. The abilities are each powerful and the card can potentially be a three for one in the right circumstances. I like the symmetrical nature of these effects. Basing it off number of creatures makes it a little bit more interesting than just giving it a flat value. 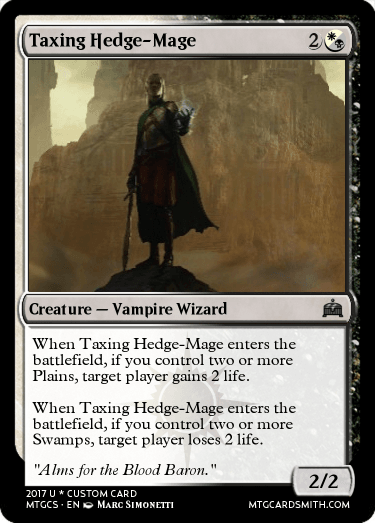 Overall my favorite hedge-mage cycle in the contest. The art on each fits perfectly and the flavor of them serving the dragonlords works perfectly. 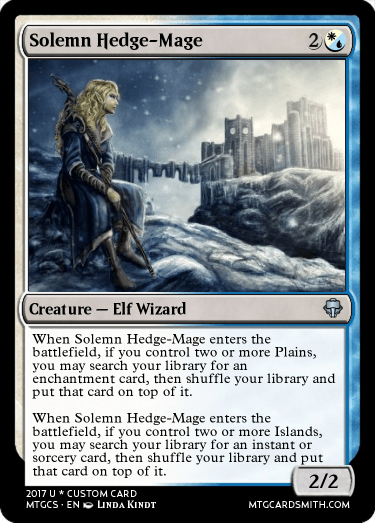 Each one is well made but my favorite is the Silumagar Hedge-Mage. In the right circumstance he is a powerful three for one but he doesn't feel too overbearingly strong. Congrats @Winners and other @Mentionables! Thanks for the contest @serpentail! @Faiths_Guide and @Beck confirmed same person. I didn't know that is someone's format. I won't do that again. It's perfectly alright! Feel free to use it as often as you like.